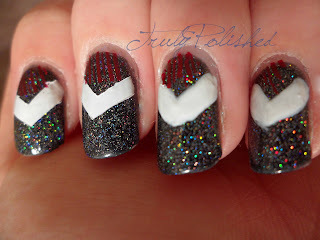 Truly Polished: Seven Nation Army Manicure! Today I was thinking about how I could paint my nails. I wanted to do some nail art, mostly because the thought of taking off my franken from yesterday broke my heart! So I thought about it for a while, turned on MTV and thought some more. Then all of sudden Marcus Collins came on TV. For those of you who don't know, he was the runner up on X Factor. I've never been a huge fan of his, and his new single doesn't help things! It's a cover of Seven Nation Army by the White Stripes. I use the term "cover" loosely as the song as barely recognisable now it has more or less a reggae accompaniment! I found the song so offensive to my ears that I muted the TV, got onto YouTube and listened to the real version. Seven Nation Army is one of my all time favourite songs, so after listening a few times and dancing round the room with my son, I set about trying to recreate the video on my nails! 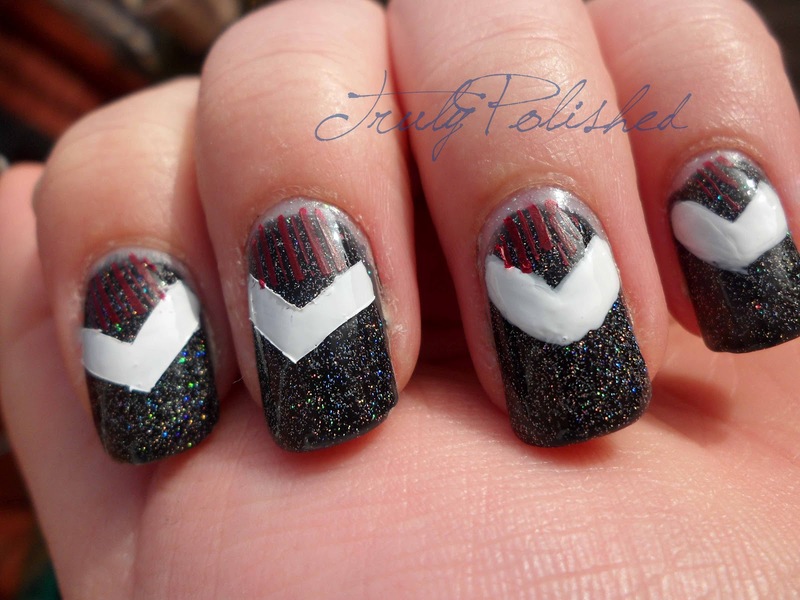 I used plain sellotape for this mani, but it took so long to cut etc that I gave up and did my last 2 fingers freehand. Now I wish I'd used the tape for all of them! The polishes I used were: Rimmel Black Out and my own Star Nursery franken topcoat (see yesterday's post), then the white is a Wet'n'Wild polish, it doesn't have a name... The red polish is Rimmel's 60 Second in Rapid Ruby. I used the Konad M44 image plate for the lines. It's the image plate that has different tips for more original french manicures. Outside in the "sun," it wasn't very bright! I really love this mani, I just wish I'd taken more time to do the tape! But I think it's a fitting tribute to the song, after all, I doubt Jack White would criticise me for a bit of a mess!